My Passover Potluck is a unique annual online event. I’ve invited my friends, both Jewish and non-Jewish, to share recipes that are kosher for Passover. My goals are simple– to foster mutual understanding between different cultures, to introduce you to my foodie friends, and to share yummy recipes and cooking ideas for Passover! To learn more about the Passover holiday, click here. When Tori approached me to contribute a guest recipe for the Kosher for Passover Potluck I was both honored and excited. There’s a long history of Chinese and Jewish culture entwining together and it’s no exception for me. Growing up in the suburbs of St. Louis, half my friends were Jewish and my classes were practically empty when Yom Kippur or Rosh Hashanah came about. My Jewish friends were always eating Chinese food for Christmas and I know that the pressure from my parents for me to become a doctor, lawyer or engineer was also shared with all my Jewish friends. But stereotypes aside (I clearly did not become a doctor, lawyer or engineer), baking Kosher for Passover was always something I loved to do. Clearly I couldn’t do it for my most Orthodox of friends, as my kitchen wasn’t Kosher approved, but for those who weren’t as strict, I made chocolate dipped matzo, then graduated to matzo meal chiffon cakes and then to flourless chocolate cakes for Passover. I looked forward to my friends’ Passover dinners (even though I never did find the hidden matzo in all my years that I attended dinners). I especially loved reading from the blue Maxwell House Haggadah. In fact, when my friend Susie had her latest Passover dinner, she had her dad mail her a family Maxwell House Haggadah for me to read, while everyone else read from photocopies. Now that’s friendship! So when Tori asked me for some ideas of Kosher for Passover recipes, I threw out some ideas and she loved the idea of a cheesecake. My partner is absolutely obsessed with cheesecake so I know that he would approve of me making cheesecake, Kosher for Passover or not. In truth, this recipe is so good, that you will want to make it year round. I know I will. 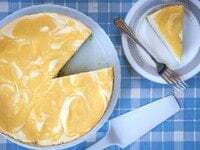 Irvin Lin of Eat the Love shares a simple and tasty Kosher for Passover lemon cheesecake recipe that everyone will enjoy, year round. Make the lemon curd by placing the sugar, lemon zest and salt in a food processor and pulse process until the sugar is uniformly yellow. Pour the lemon sugar in a medium pot and add the lemon juice and eggs. Whisk together and place on the stove over medium-low heat. Add the butter and cook, whisking constantly, until the whisk holds marks as you stir, about 5 to 6 minutes. Pour the curd through a fine mesh sieve into a heatproof bowl and cover with wax paper. Let cool to room temperature as you prep the rest of the cheesecake ingredients. Preheat the oven to 350˚F. Turn the bottom of a 9-inch springform pan upside down so removal of the cheesecake from the bottom is easy to do. Smear a little softened butter on the bottom of the pan and place a 9-inch parchment paper round at the bottom of the pan. Place on a rimmed baking sheet. Make the crust by placing the pistachio nuts, matzo meal, sugar and salt in the food processor (don’t bother cleaning the processor from the lemon sugar). Pulse process until the nuts are finely processed and the entire crust is uniform in color. With the processor on, drizzle the melted butter into the machine. Once all the butter has been added, turn the processor off and dump the wet crumbs into the bottom of the lined 9-inch spring form pan. Using the back of a spoon, press the crumbs evenly into the bottom and up the sides of the pan (it doesn’t have to go all the way up, just as much as you can). Place the crust in the oven for 8-10 minutes, or until the edges of the crust start to brown a bit and smells fragrant. Remove crust from oven and turn the oven down to 300˚F. Make the filling by placing the cream cheese and sugar in the bowl of a stand mixer fitted with a paddle attachment. Beat the cream cheese and sugar together on medium speed until fluffy (about a minute or two). Add the honey and beat to incorporate, about 30 seconds on medium speed. Add the eggs, one at a time, waiting for each to incorporate before adding the next one. Add the sour cream, lemon zest, and vanilla and beat to incorporate. Carefully spoon 2/3 of the filling into the prebaked crust and spread out evenly on the bottom. Spoon 2/3 of the curd over the filling and swirl with a butter knife. 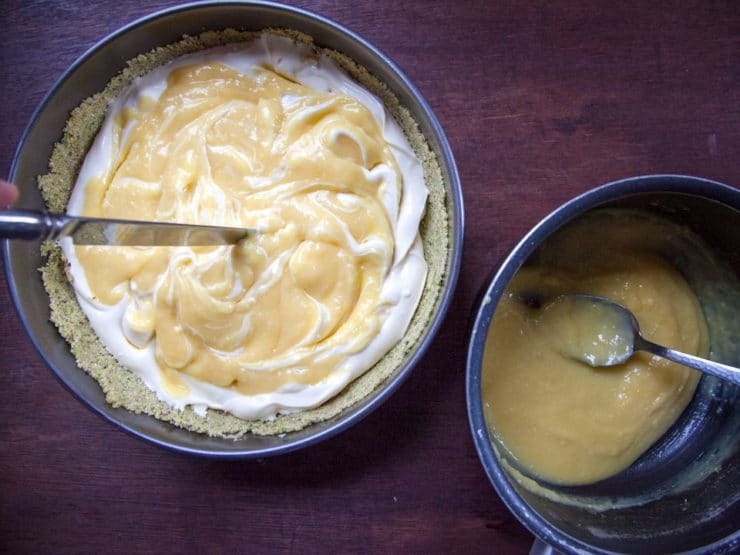 Cover the curd with the remaining cheesecake filling and drizzle the remaining curd over the top of the filling. Marble with a butter knife decoratively. Put the cheesecake in the oven (still on the baking sheet) for 50 to 60 minutes, or until the edges of the cheesecake start to puff up and look solid. The center of the cheesecake will be wobbly but don’t worry, it’ll firm up as it cools. 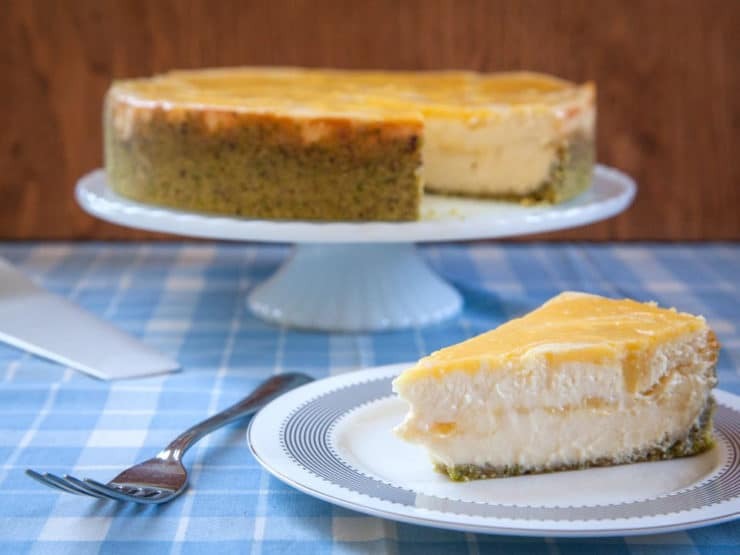 Once the cheesecake is done, turn off the oven, prop the door of the oven open with a wooden spoon, and let the cheesecake cool in the oven for an hour. Remove from the oven and let cool on a wire rack for an additional two hours or until the bottom of the cheesecake pan doesn’t feel warm to the touch anymore. Cover the pan with aluminum foil (don’t let it touch the top of the cheesecake!) and refrigerate overnight or at least for 8 hours. Serve from the fridge or let it sit out for about an hour before serving for a slightly less firm texture. This Lemon Honey Cheesecake looks delicious and gorgeous–perfect for my Passover dinner finale this year. You have a great photographer who must love food! I have successfully made cheesecakes ahead and frozen them but I’m wondering about this one. Will the lemon curd in the cake do well frozen and then defrosted? Thank you for your great advice! The lemons where I currently reside in the Caribbeans are generally green-colored. If there is a possibility that its zest will make the curd or cheesecake filling look less appealing (green bits?? ), what can I use to substitute? By the way, thank you for this wonderful recipe!! I made this cheesecake while in the States last month and the family loved it! My desire is to replicate this somewhat successfully on the island for Passover. I am planning ahead now since resources are limited here. Any helpful tips or guidance would be greatly appreciated! Hi Gwen! Lemon zest adds more flavor here, but I don’t think it’s entirely essential. What you might do is omit it from the filling (if you’re worried about color) and use 1 tsp or so in the crust, which is already green-hued. Is the juice from these lemons green as well? If yes then you may have a more green-swirled cake, in which case the zest might not look strange! Can a different fruit be used instead of lemon? Absolutely the best cheesecake ever, passover or not! Always get rave reviews for folks who really know their cheesecakes, New Yorkers. Can’t believe I made this and it came out gorgeous and delicious. My daughter is a great baker. She hates the traditional Passover desserts, but she loved this and asked for the recipe. It is an amazing dessert. So good, I would use this even if it’s not Passover. Thank you for the recipe. This is the second recipe I have tried from you website. I made your hamantashen dough recipe and it too was delicious. I plan on using the Gluten free mini tart shells made by Gefen (Acceptable for Passover) – I’m going to be making 24 mini tarts. What, if any revisions should I make for the filling? Thank you! Hi Marie, Tori’s assistant Ashley here. This recipe was shared by Irvin Lin of Eat the Love during one of our past Passover Potlucks. Unfortunately I am unable to advise here and am not sure if he still responds to this thread. Could you please let me know are the pistachios used for the crust roasted and salted, roasted unsalted, raw and I roast them myself. Raw unsalted pistachios should be used for the crust. This cheesecake is excellent and can stand on it’s own any time of the year. My non-Jewish Passover guests agreed. And the Passover. And the Passover Chocolate Chip Cookies were very tasty, too. Thanks, Tori! A Christian friend told me about this “best cheesecake ever” recipe. It looks amazing and I love pistachios but my younger son is allergic to nuts (tree nuts and peanuts, not coconuts or his crazy dad). Any thoughts about what might work well in place of the pistachios? Thanks! Hi! I would like to make this cake for my husband who is diabetic. I generally change the sugar with Splenda – will it work here? Are there any adaptations I should make? Thanks from Israel!! This looks delicious. To make it any other time of the year, would I use graham crumbs instead of matzo meal in the crust? Hi Shayna! Yes definitely. You can certainly do a graham cracker crust. Just use 5 oz (about 1 1/3 cups graham cracker crumbs) instead of the matzo meal and pistachios. Could I substitute almonds for the pistachios? Sorry I didn’t respond earlier! Yes you can substitute pretty much any nuts you wants, but the pistachios not only look pretty (with green is especially vibrant against the yellow cheesecake) but also taste really great with the lemon flavor. But almonds would work really well. I hope you had a great Passover. Hi Irvin – I got sidetracked reading your post, went to search google for vintage hagaddahs, looking for the one we used as when I was growing up. No luck. Thanks Lori! I love that you went looking for vintage hagaddahs! Have you seen this site: http://maxwellhousehaggadahproject.tumblr.com/ ? It’s documents maxwell house haggadahs through the years. So fun! Hope you had a great Passover! 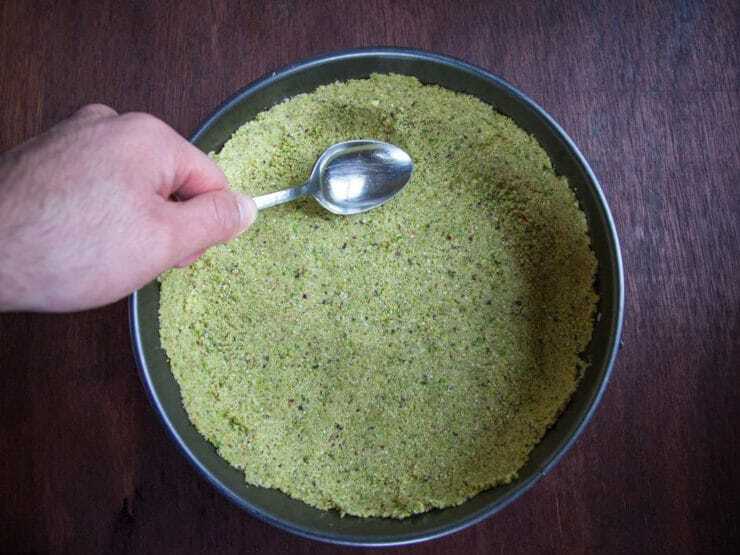 Pistachio crust? Irvin will you marry me? I am totally making this. It’s all my faves in one place. Including Irvin and Tori. You’re right! I forgot about the soy in Tofutti brand. There is no Trader Joe’s here in Toronto and I have not seen Daiya products. If I can find substitutes, I’ll post the brands. If not, I’ll save this recipe for Shavuot. Thank you for the tips!!! NO TRADER JOE’S in Toronto???!!!!??? Good grief, that’s awful!!! It’s such a fun place to shop! Hope you get one soon! This looks like such a delight! Yum! Can this recipe be made pareve? Will I work with Tofutti non dairy sour cream and non dairy cream cheese? In theory it should work but I’ve never done it before so I can’t guarantee it! But I know vegans who have made cheesecake with tofutti products before so it’s definitely possible. You may want to add a tablespoon or two of potato starch to help bind the batter together if you aren’t using actual cream cheese. Of course, if you are avoiding kitniot for Passover you obviously can’t use tofutti products because of the soy. If you are avoiding kitnoit, there are other non dairy cream cheese substitutes out there (I believe Daiya makes a cream cheese style spread that is coconut based and Trader Joe’s has one too). But again, I haven’t made cheesecake with them, so I can’t guarantee what the end result will be. If do you experiment though, please check back and let me know how it turns out!